In some circumstances, productboard may not be able to communicate with JIRA. Follow the tips below to resolve any issues and please let us know if you experience any issues not listed below. 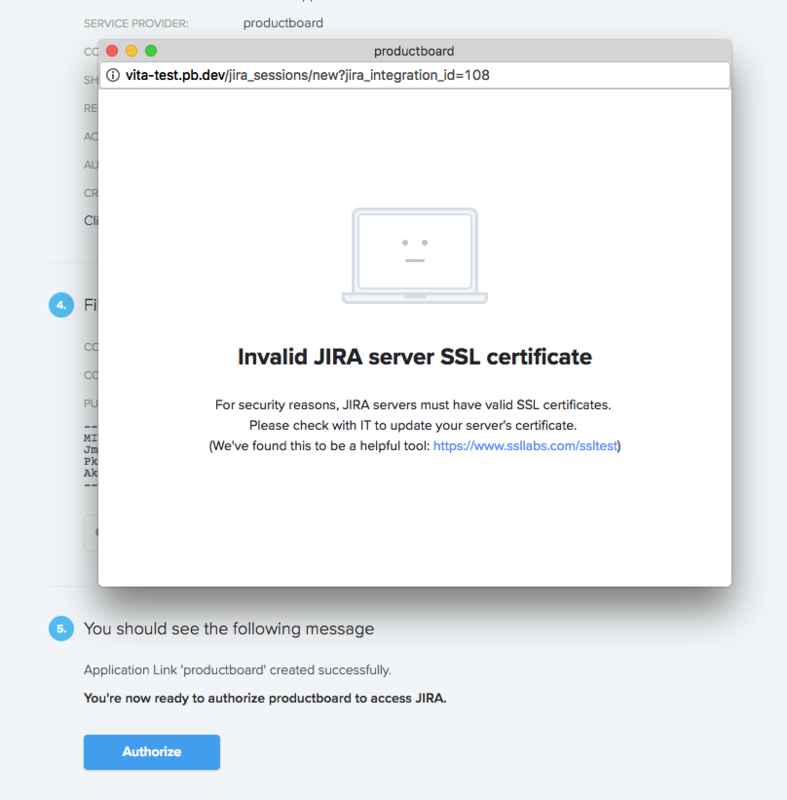 productboard requires that all JIRA servers have valid SSL certificates. If yours is invalid, a small update may be all you need to be on your way. See what's causing the issue using a utility like this SSL Server Test. You'll need to log in as a user with the JIRA Administrators global permission. In your JIRA account, head to any open issue (or create a test one if you'd like). Click to Edit the issue. From the pop up panel, click on Configure Fields > Custom. Then ensure that the Reporter box is checked. You can also complete this action for multiple projects at once by heading to JIRA settings > Issues > Field Configurations (Default). From there, scroll to Reporter and select the Screens button next to Edit. Please check the boxes for all of the projects you'd like to connect to productboard and click Update. 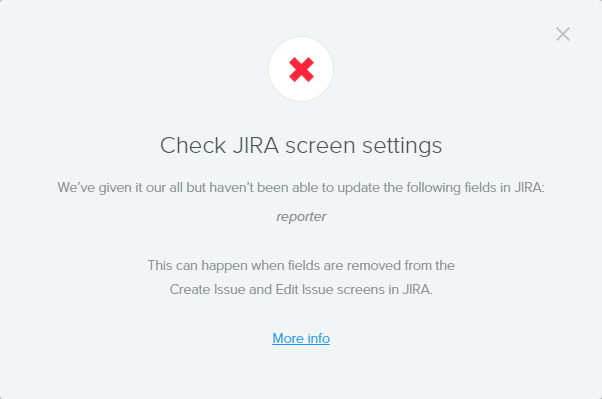 For more help, refer to the JIRA help article Defining a Screen. ⚠️ We are not able to connect to JIRA project. Try reauthorizing access. Someone may have removed the application link to productboard in JIRA. To get back up and running, reauthorize the JIRA integration. ❓ How do I add a JIRA administrator? Go to Settings › Projects. Choose the project you have connected to productboard. Check your user permissions in Jira. If you don't have a role in Jira- it will default to the Project Lead. Check if your email address matches both accounts. Check if you are the Feature owner in productboard for the ticket. ❓Why can't I push some features into JIRA? Features beneath any given component can only be pushed to a single project. As soon as one feature has been pushed into a given project, all sibling features under the same component must be pushed into the same project. ❓If I delete a story in productboard that's already linked to JIRA will the 2 way sync delete the story in JIRA? No, the productboard link in JIRA will disappear but the data in JIRA will remain. ❓Is it possible to import existing JIRA fixVersions into productboard? Not quite, but there's a trick. If you create a release by the same name in productboard, when you push features within that release into JIRA, they will automatically sync with the existing fixVersion. ❓How can I push a productboard component to an epic in JIRA? ❓Our previous JIRA owner has left the company. What do we do? Once you've transfered ownership in JIRA, you'll need to reauthorize the JIRA integration in productboard. If you don't see a Reauthorize option on your JIRA settings page in productboard, reach out to a member of our team for assistance.